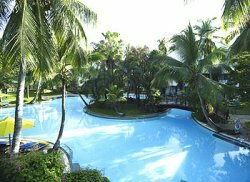 Here’s my list of favorite hotels in Mombasa and the beach region around that coast city. I did this since people, when they say they’re looking for hotels in Mombasa, usually actually mean a beach hotel in the vicinity of Mombasa instead of a hotel in the city itself. It’s a kind of top 5, except that I included both cheaper and more expensive options. Therefore, it’s hard to say which hotel is my absolute favorite, since we’re not comparing apples to apples here. And of course, different type of hotels appeal to different people, so instead of a numbered list I’m providing you with descriptions that will give you an idea where to look. 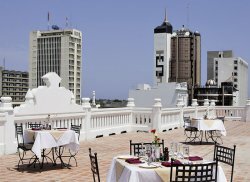 The good news is that hotels in Mombasa and vicinity are a lot cheaper than in the capital of Nairobi, where international organizations and major East-African businesses are located. Basically, you have a top-end hotel in Mombasa for the same price of a midrange hotel in Nairobi. 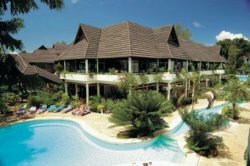 The best travel agency in Kenya to help you pick a hotel is Africa Point (located in Nairobi, Kenya). Most hotels in Kenya are in their database, and they will personally help you pick the best one based on your preferences. Africa Point is known for it’s very patient, one-on-one customer service and tailor-made approach.